THE CAFE’ OCCURS THE SECOND WEDNESDAY OF EACH MONTH. After seeing the need for caregiver support in the area, Crater Community Hospice will begin to host a monthly Caregiver Café. The café is open to all caregivers and will be held on the second Wednesday of each month from 3-4 p.m. with the first on November 14th. 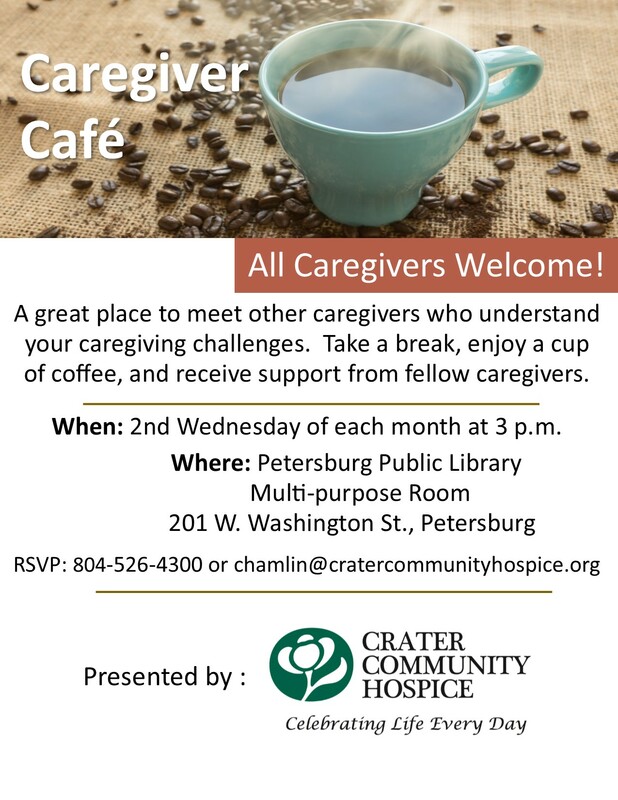 It will be held in the multi-purpose room of the Petersburg Public Library at 201 W. Washington St.
“The caregiver café will be a place for caregivers to take a break, talk with others in similar situations, enjoy a cup of coffee and receive support,” said Cindy Hamlin, Development Director for Crater Community Hospice. “Crater Community Hospice saw the need in our community for caregiver support and developed the café to meet that need,” said Tracy Taliaferro, CEO of Crater Community Hospice. “We hope it will be a helpful resource to the caregivers in our community,” said Taliaferro. The café is open to unpaid caregivers and the person receiving care. The café is a neutral environment to offer support to the community and will be facilitated by the Crater Community Hospice team. Since 1995, Crater Community Hospice has provided exceptional care and support to over 6,000 of your neighbors. Our mission is to educate the community on serious illness and end of life concerns and provide families and patients with quality care and supportive services. We are the only licensed, nonprofit, community-based hospice in the Tri-Cities. We also serve Dinwiddie, Prince George, Sussex, Surry, Charles City, Greensville-Emporia and Chesterfield Counties. For more information about Crater Community Hospice’s programs and services, upcoming events, or volunteer opportunities, call 804-526-4300 or visit our website, www.cratercommunityhospice.org. Crater Community Hospice is a non-profit 501(c)3. Your Community Hospice since 1995.